Zentimo help - How to manage encrypted volumes? Help > How to manage encrypted volumes? Encrypted Volume Management feature allows you to assign the program to manage encrypted volumes of TrueCrypt, VeraCrypt or CipherShed located on external devices. It means that the program can automatically mount such volumes on device connection, show them as a part of the device, display processes preventing the volume from being dismounted etc. In short you can operate your encrypted volume located on an external device as if this drive is a partition of the external drive. The encrypted volume must already exist on your device and it must not be mounted on setup. Create it manually if it's not there and dismount in the encryption software if it's mounted, before adding to the program. Right click the "Menu" button and choose "Device Properties"
Path to encryption software executable. The software must be located either on selected device drive or on a fixed disk. What encryption software is used: TrueCrypt, VeraCrypt or CipherShed. Usually this field fills automatically based on executable name. But if the name is not standard you have to fill it out. The option "Hide this partition in the menu" allows to hide the mentioned container partition in the device structure. Usually you don't need to see it in the list since this partition doesn't have a file system so you cannot operate with it on the menu. Also you can switch to the "Drive Properties" tab and remove the drive letter of this container partition to avoid messages from system to format the partition. If the encryption software is located on a drive it also must be installed on the computer, otherwise the encrypted volume will not be mounted correctly. If the encryption software is located on a drive and volume is loaded from a file they must be located on the same partition (of there are several ones). Settings of encrypted volumes loaded from partitions are not portable, because there's no way to load settings from the encrypted volume before its mounting and decryption. So if you wish to have an encrypted partition automatically managed by Zentimo on several computers you should setup it on each one. Paths of the encryption software located on drive and encrypted volume file are actually not depending on a drive letter of the device. Those absolute paths that you are seeing are just for the reference, if you change the drive letter of the device the paths will also be changed. Finally click "Apply" or "OK" button to save the settings. The program will offer you to mount now the added volume. If you click "Yes" the program will mount the encrypted volume. If you skip it you can mount the volume later with "Mount" button in this dialog or in the device menu. It's not possible to change the parameters of currently mounted encrypted volume. Delete settings of the encrypted volume. Deletion of settings will not change a file\partition of encrypted volume. It will just made it not managed by Zentimo. After you added all encrypted volumes for the device, close the "Properties" dialog. Your encrypted volumes are now ready to work. If for any reason the volume is not mounted you can mount it manually from the menu: click "Menu" button, choose "Mount encrypted volume" and then choose desired volume. When you are trying to stop the whole device all mounted encrypted volumes will be dismounted automatically. 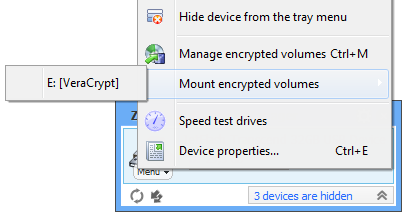 You can also dismount the volume by clicking on "Dismount encrypted volume" button in the quick-menu. Before device stopping the program tries to dismount the encrypted volume and if some processes prevented it from being dismounted the "Cannot stop device" window is displayed so that you can review the processes preventing it from being dismounted and forcibly detch them if needed and repeat the action.